Close your eyes for a second. Picture in your mind where your closest water faucet is. Chances are that you are less than 15 feet from a sink, shower, or a garden hose. And, the chances are even higher that you have multiple places in your home where you can retrieve clean drinking water and have the option for it to be hot or cold. Now, imagine all of those water sources have vanished and map out in your mind where the closest stream, pond, puddle, lake or natural water source is. This is your only water source, your life source, and you have to visit this source multiple times a day to have enough water to cook, clean and bathe with. Also, when you are thirsty, there are no water bottles in the refrigerator to grab and you have to walk back to this far away source to quench that thirst. Sadly, this source does not produce crystal clear water, instead it is dirty and gives you diarrhea, typhoid or cholera; but you drink it anyway because there is not a better alternative. Open your eyes. The water crisis is real. 800 million people lack access to clean water in our world. 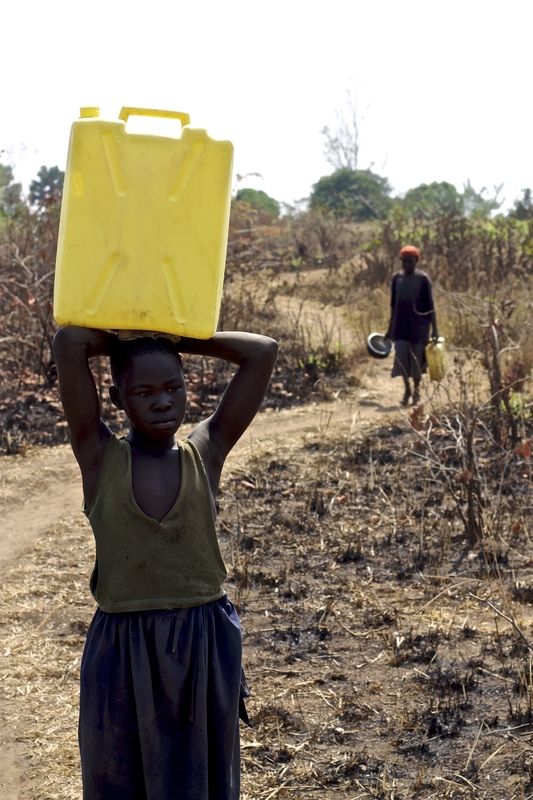 Water related illnesses kill more people than all forms of violence, including war. I have witnessed the water crisis first hand. 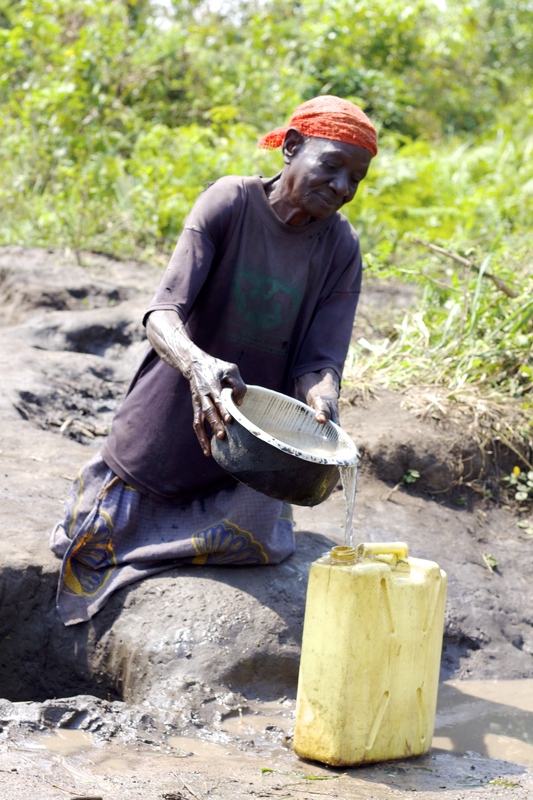 As a Field Volunteer for charity: water, I am responsible for visiting villages in rural Northern Uganda and report on previous water boreholes charity: water has implemented. With an assignment of 70 villages, I was bound to encounter villages whose clean water sources have been broken, been stolen or have slight malfunctions. And I did. The whole purpose of my assignment was to get a pair of eyes to the villages and to gather information so we can get mechanics out in the field to fix these issues. As I was searching for one of the charity: water sites one day, I came upon a group of people collecting water from the ground. I was 2km away from the site on my list, however I was very compelled to speak to this group of people who seemed very curious why a mazungu was in their neck of the woods. I ended up spending a good hour with the amazing people of the Adwil Village. In that hour they explained that there is a water pump 800m away from their village, however they are not allowed to use it because it is over crowded and has large wait times at all parts of the day. 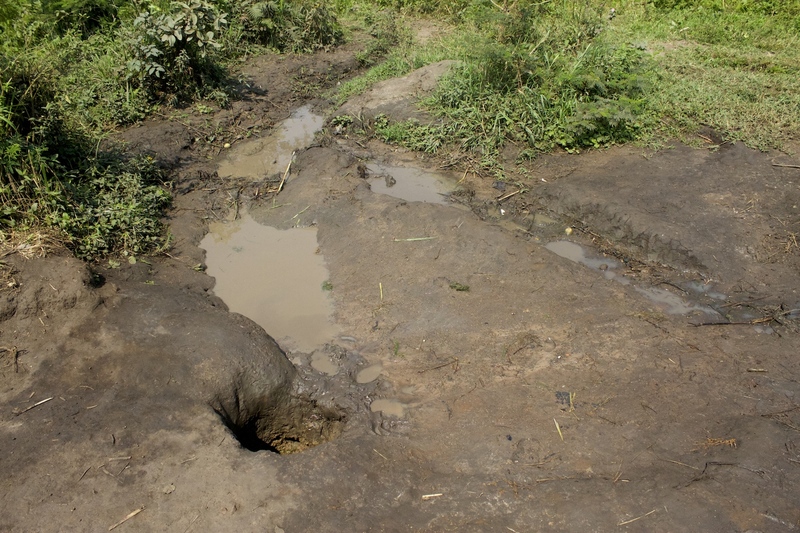 So, the 100+ families of their village drink from this contaminated water source. This hole in the ground produces water that is not suitable for anyone to drink. Gathering water is given the highest importance in many villages over things like education, family time or social development. 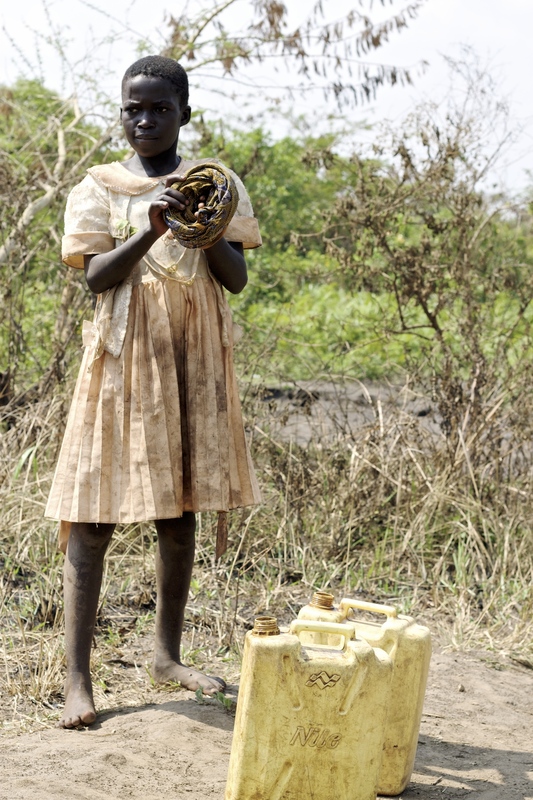 Children like Patricia Okoi spend the time they should be in school fetching water 7-8 times a day. She is 12 years old and has stopped attending school because she is so accustomed to collecting water that she does not prefer school. My driver also explained that schools are very strict about their 7:30 AM start-time in the morning and if students are late, they risk being punished or beat. Many mornings the lines at a water source are outrageously long so children cannot guarantee making it to school on time. This scene right here is exactly why charity: water exists. 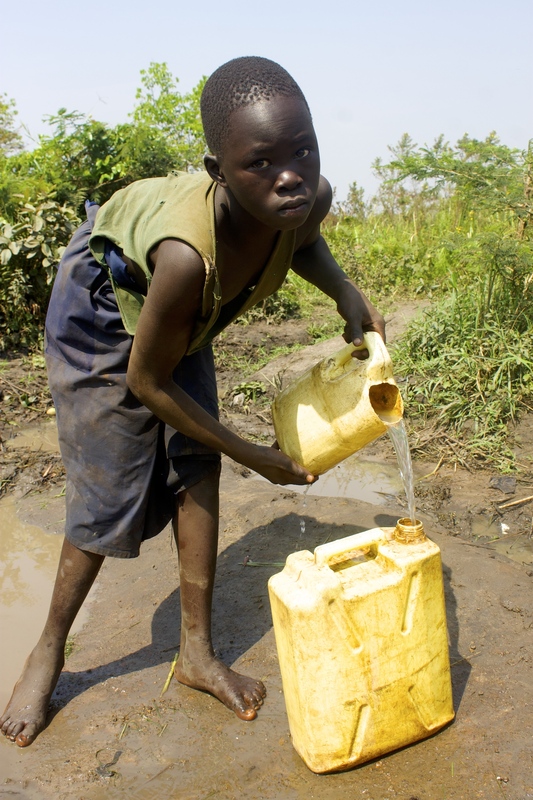 No human being should be forced to resort to drinking contaminated water like this. This grandmother says she wishes every day that her grandchildren could have clean water and could have more time to focus on the more important things in life like education and family. The path to a water source is a frequently traveled path. When was the last time you had to take your bicycle to get a glass of water? 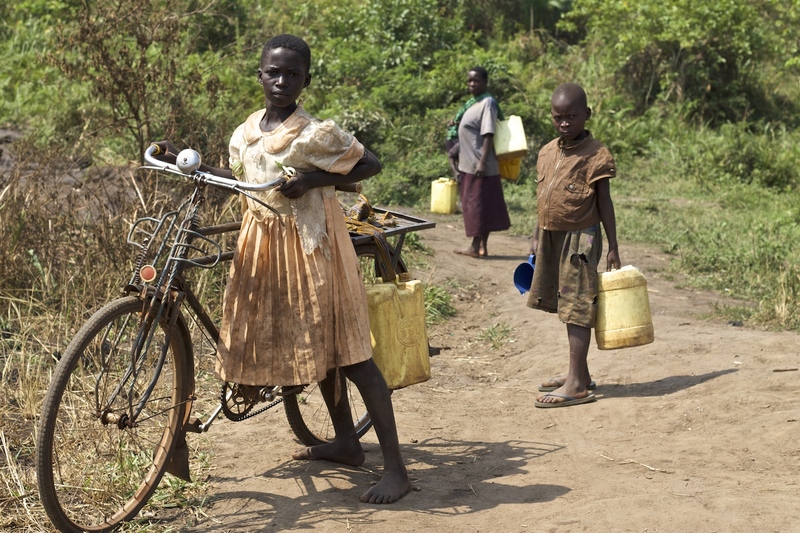 This is one of the most common ways to carry water in Uganda. Little kids slowly take on more responsibility and graduate from their 10L jerry cans to 20L jerry cans that weigh over 40lbs. Luckily, Patricia’s brother was there to help her lift this jerry can on top of her head. Usually, this is a feat people conquer on their own. 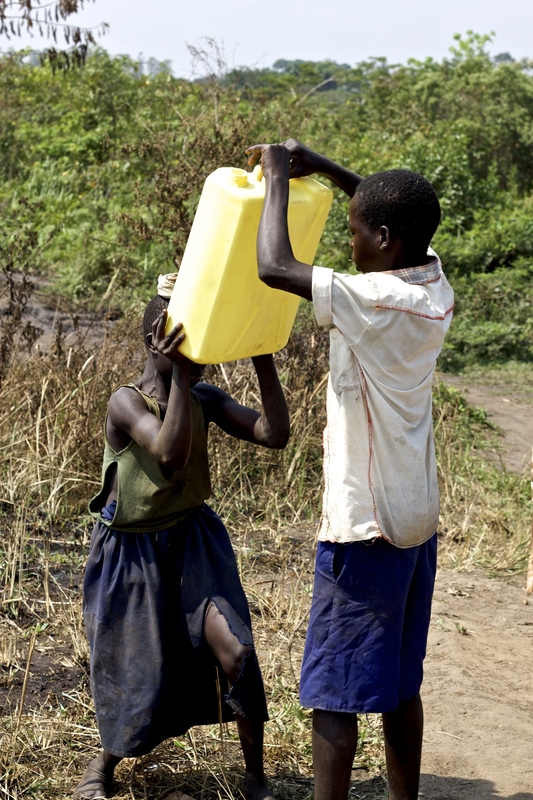 Carrying water on your head is the most effective and easiest way to transport water according to the people I encountered in Uganda. Women and children can balance almost anything on their heads from crates of bananas, to water, to stacks of tree limbs. This 11 year old girl is Akullu Sabella. She has so much potential ahead of her and having clean water would help her immensely reach that potential. The most beautiful thing I have learned from working with the people of Northern Uganda is that even though things are tough and resources are slim, life is still something to enjoy and appreciate. These three children from the Adwil Village may lack some of life’s most essential necessities, but they are still some of the happiest people I have ever met. Remember, life is a beautiful thing. I am confident that some day all people will have access to life’s most basic need, clean and safe water. My confidence comes from knowing that organizations like charity: water are devoting everything they have to making that a possibility for everyone.